Markarth is a major city located in the Reach, near the border of High Rock. 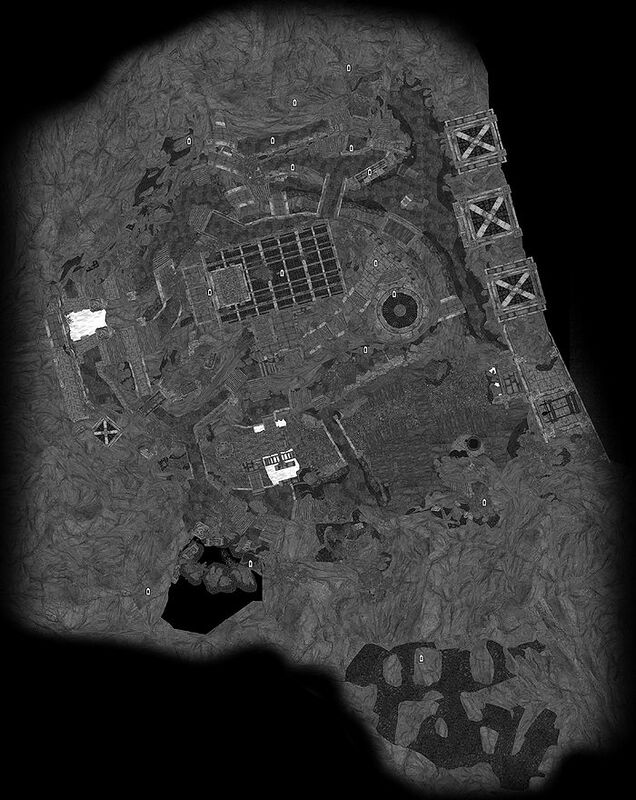 It is housed in an ancient Dwemer city, giving it architecture noticeably different from most cities in Skyrim. Much of the city is carved into the rock face which surrounds it. Jarl Igmund is the ruler of the Reach. He is having issues with a group known as the Forsworn. Though there are many races populating the city, the people of Markarth are not fond of outsiders and the guards treat them with hostility and suspicion. Half the city is owned by the Silver-Blood family. 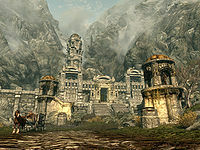 The Silver-Bloods also own Cidhna Mine, which is actually inside the city walls and used as a prison, said to be the most secure prison in Skyrim. There is an area dug into the cliff called The Warrens where most of the poor of Markarth live in extreme poverty. Many of the workers in the Warrens work in the mines and at the smelters in the area. The guards are quartered in a Dwemer dormitory carved out of the stone beneath the imposing Guard Tower at the center of the city. The Silver-Blood Inn near the entrance to the city is a good place for brawling, picking up bounty letters, hiring a follower, or renting a room. There are several shops in an open-air marketplace nearby. Markarth also houses Understone Keep, an ancient Dwemer castle carved deep into the mountain, which can be accessed by walking through the guarded door at the top of the main path through town (it will be discovered as a separate location). The surrounding area is rich in minerals and ores, but be careful of Forsworn members. They infest the surrounding countryside and will attack on sight. For more information on Markarth, see the lore article. †These people only sell goods at the market. 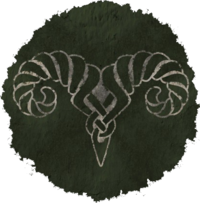 ‡Ghorza gra-Bagol only offers services at the forge located outside the Castle Markarth proper (just north of The Hag's Cure). ^aThese people can die as part of the Taste of Death quest. ^bThese people can die as part of the No One Escapes Cidhna Mine quest. ^cThese people can die as part of the Forsworn Conspiracy quest. ^dThese people can die when you first enter the city. ^eVigilant Tyranus can die as part of the House of Horrors quest. ^fBanning is not a potential follower, but will sell the canine follower Vigilance. ^gFjotra only appears after the quest The Heart of Dibella. Bothela The Hag's Cure Bothela's Discreet Delivery: Deliver the Stallion's Potion to Raerek or Reburrus. Frabbi Silver-Blood Inn Speak to Degaine: Ask a beggar about money. Ghorza gra-Bagol Understone Keep Skilled Apprenticeship: Retrieve a skill book for Ghorza gra-Bagol. Kerah Endon's House Delivery to Calcelmo: Deliver a ring to Calcelmo. Kleppr Silver-Blood Inn Speak to Degaine: Ask a beggar about money. Moth gro-Bagol Understone Keep Coated in Blood: Bring a Daedra heart to Moth gro-Bagol. Ondolemar Understone Keep Search and Seizure: Find evidence of a Talos worshipper for the Thalmor. Evidence of the former Dwemer presence in Markarth is found in the deserted ruins of a Dwemer city. The ruins still contain several operational (and hostile) Dwemer machines. 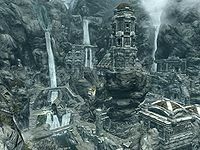 Markarth is a unique city in that a great many citizens may get killed depending on the choices that you make during quests, making the phrase that only "Blood and Silver" runs through Markarth true. See the notes to the table of NPCs above for details. Markarth previously appeared in Arena as Markarth Side. There is a dialogue glitch with Markarth guards that occurs after the two Forsworn quests. They will attempt to arrest you, and if you reply with any option other than resist arrest, the dialogue will repeat endlessly. ? The simplest way of resolving this is to go back to the Temple of Talos and speak with the guards inside. Choose the option to go to jail, then walk outside and speak to another guard to pay your bounty, persuade, etc. successfully. For various other methods on how to resolve this, see the talk page. The steward Raerek may refuse to speak with you, or will not offer to sell you Vlindrel Hall. See this section for details. ? This page was last modified on 29 January 2019, at 04:32.